The new S Edition trim aligns the Zoe with the rest of the simplified range of Renault cars and ensures it continues to offer a simple choice with strong value to customers. Additional equipment includes the BOSE stereo, which features DAB radio. Meanwhile, manoeuvring is easier than ever thanks to the rear parking camera. All of the seats are finished in a leather and textile covering and comfort is enhanced with lumbar adjustment on the driver’s seat. On the exterior of the Renault Zoe S Edition the customer can choose between 16-inch ‘Black Shadow’ alloy wheels or, at no additional cost, they can upgrade to 17-inch ‘Black Optemic’ alloy wheels. 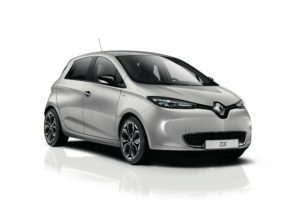 These features are in addition to those found on the entry level Renault Zoe Dynamique Nav, which includes a hands-free keycard, rear parking sensors, automatic wipers and lights, climate control, and a leather steering wheel and gear knob. Also featured are front and rear electric windows, and electric, heated and folding door mirrors. Voice-controlled satellite navigation is also standard on all Renault Zoes via an embedded tablet in the centre console that includes a seven-inch touchscreen. The Renault Zoe S Edition is priced from £19,270 on the road including the government Plug-in Car Grant. Customers can choose to buy their Renault ZOE and lease the battery, or they can purchase the full car outright (referred to as Zoe i). Battery leasing begins from just £59 per month.